"Strategically navigate as a cell through a world of other cells consuming smaller cells and avoiding larger ones." Progress through many worlds of levels strategically navigating as a cell through a world of stranger cells. In order to survive, you must consume smaller cells to become larger and avoid larger cells from consuming you. 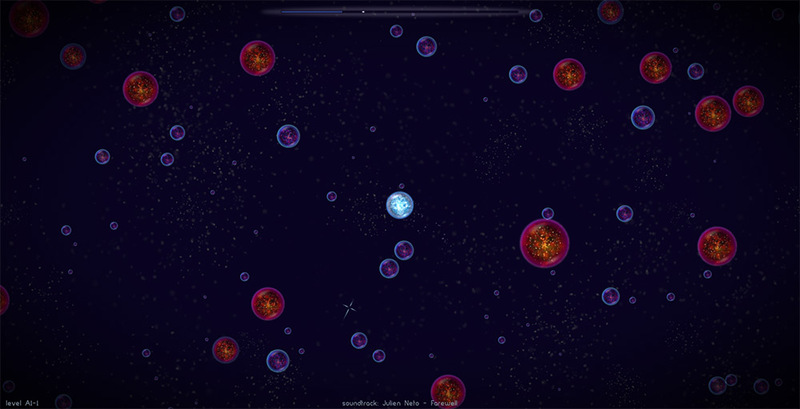 In Osmos, in order to avoid the larger cells, it is important to consume smaller cells to become larger than all of the stranger cells that are larger than you, so you can consume them as well. When you move in Osmos, you are using elements of your own cells to propel you forward, so constantly propelling yourself is strongly discouraged since this will make you smaller slowing but surely. Make sure to, little by little, propel yourself around to other cells. Try not to waste by propelling yourself into useless territory. You should be moving around by constantly attempting to consume smaller cells to become larger. There are 72 single player levels, and each one harder and harder than the last. Each one with varying amounts of cells. Some of them the cells move faster than others, and the larger cells are also trying to consume you. So you must make sure to avoid those while consuming all of the smaller ones, which will also be trying to avoid you. It is a hard world in the world of cells while trying to survive to become the most powerful cell of the realm you are in. There are eight types of levels: Ambient, Solar, Antimatter, Impasse, Repulsor, Sentient, Warped Chaos, and Epicycles - all completely distinct from one another. Each of the levels, being different, keep the game interesting and want to keep going. Each one of them you will find yourself being better than the other, and favoring one over the other. There are also multiplayer arenas. There are six of these arenas that can be playing over the Internet or even Bluetooth against your friends or random strangers. Test your skills against other people that have the game and see if you can be the alpha cell within your realm. With an award winning soundtrack, you will find yourself becoming addicted to the music in the game, which are by the artists Loscil, Gas, High Skies, Biosphere, Julien Neto, and more! Not just that, but the game even has achievements to keep you busy to get them all which all have Game Center and Google Play integration for mobile devices.